KEVIN ME-II Wire Mesh Packing has enhanced self-wetting characteristics; as the fiber is woven from fine diameter wires. 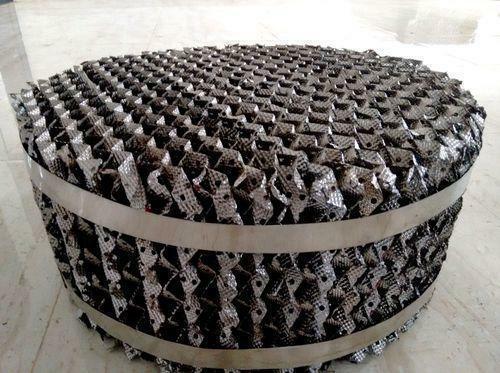 The packing element consists of parallel-perforated corrugated sheets of wire mesh. These packings are particularly suited in separations that require a large number of separation stages, which typically operate under high vacuum and therefore low liquid loads. The capillary action of the wire mesh ensures complete surface wetting & hence provides a low HETP. Typically 5 to 10 number of theoretical stages per meter of packed height can be achieved with this packing when complemented with high efficiency internals. Can be adapted to any fractionating task by variable specific surface. Munters India Humidity Control Private Limited is an ISO 9001 certified company, engaged in design, manufacture, supply and installation of mass transfer equipments viz: Tower Trays, Tower Packing (Random & Structured Packing), Column Internals, Mist Eliminators (Mesh & Vane). Our manufacturing facility is equipped with modern equipment and with dedicated engineering and manufacturing professionals to ensure timely delivery of our quality mass transfer products.